The idea of wallstickers.ie was born when we realized that professional and affordable Wall Stickers were not readily available in Ireland or the U.K. Our search to find a team of enormously talented graphic designers took us far and wide. Once assembled, the team then set about creating the unique Wall Sticker designs on our site, of which we’re all extremely proud. With its assortment of inspirational ideas for adding style and glamour to your home or office, we hope you enjoy browsing our website and come back soon for more! - There are times we seek inspiration from other websites, like for example this time. A while ago I was browsing this French website domestic.fr and I came up this Eiffel Tower design with measuring tape on. From that point onwards we came up with a number of our own “measuring” wall stickers. - Some of the designs available are the measuring tape on its own, Madonna, Eiffel Tower, Statute of Liberty and lots more, so do not hesitate and browse for more! So today we have available measuring tape it self, Madonna, Eiffel Tower, Statue of Liberty and lots more. Ups… and let’s not forget about our bestseller for kids bedroom “ Centimeter giraffe”. Very often we receive e-mails with questions if the wall stickers can be use in a bathroom. Yes! They can. On tiles, over bathtub or on the shower door. Result can really surprise you. It might be funny or romantic. It’s only up to you. 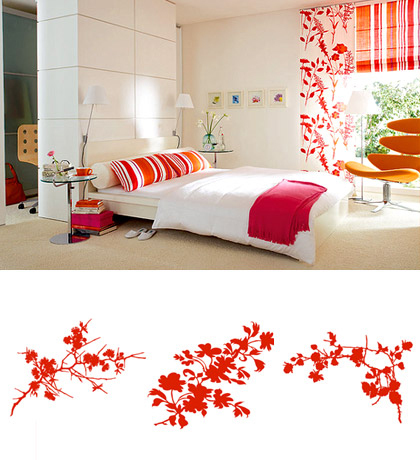 Take a look on our wide range of special bathroom wall stickers or choose whatever you like. Click on the pictures above to see the stickers. Do you remember this fun game from yours childhood? We do, so that’s why we add this adorable wall stickers to our shop. But who sad wall stickers can be putted only on the wall? Not we! We go farther and come up with “floor” wall stickers which are fun, pretty and educational as your child can teach animal names, numbers and shapes. Take a look and choose which one you like most. Click on the picture above to see the stickers. 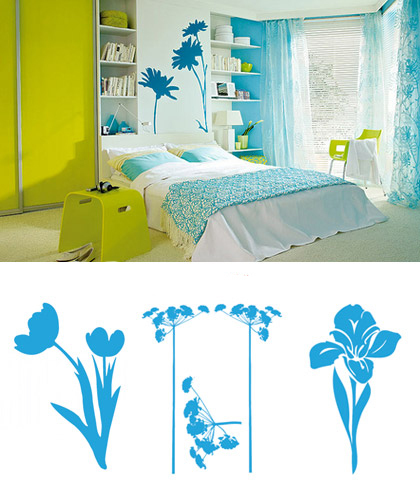 You can create very similar result using (inter alia) our wall stickers. We have very wide range of twigs and flowers in 30 colors to choose from. You probably didn’t realize that looking on our stickers, you look on a famous celebrities. Your favorite pinups and flower models turns out to be silhouettes of Claudia Schiffer, Gisele Bundchen, Halle Berry (picture from Versace fashion house campaign) and Jennifer Lopez. Would it be great to have them on your wall? Click on the picture above to see the stickers! demonstrating how a plug can be transformed into a puppy’s nose or elephant’s tail.